Don't waste time to find and test public proxies. Just select a USA/Europe IP you wish to use from our list. Every IP address you see is 100% usable, high anonymous and secure! Both Http and Https are supported. We don't require user to input any personal info to use, we don't log and track any user behavior. We provide 3-day free trial for users to verify the service. Full Compatible with IE/Google Chrome/Mozilla Firefox! Your IP address can link your internet activities directly to you, it can be used to find your name and location. The websites you visit could trace you, even get some very confidential infomation. So protecting your Online Identity is a must, thus Anonymous Web Surfing and the ability to hide your IP address are mandatory in order to ensure a high level of online protection. By using Proxy server, your IP address is changed to an anonymous hidden IP address and hence not associated with you. A proxy server acts as an intermediary, routing network packets between your computer and the Internet. We provide US/UK/DE private proxy servers for you. You don't need to find and test public proxy one by one which may be dangerous and slow. Our every proxy you see is 100% usable, high anonymous and secure! Both Http and Https are supported. You will appear to access the internet from a different location, not your own (real) location.From below picture, you can get overall understanding. All websites you are visiting see the IP address of the proxy server instead of your own IP address. They only know you come from US/UK/DE, your real IP address is hidden. Furthermore, Quick Hide IP Platinum provides "One Click" solution for you to switch proxy in browser. You could select your favorite proxy and press a button, the software will do all configuration in browser for you.It also has the "Auto Hide IP" mode which could switch proxy server every a few minutes automatically. It is full compatible with Internate Explorer, Firefox and Google Chrome. Hide your IP address and location from the web sites you visit. Fully compatible with Internet Explorer, Google Chrome, Mozilla Firefox. Fully compatible with Windows XP,Windows 2003,Windows Vista and Windows 7. Easy way to change browser proxy settings on the fly. Automatically switch IP address every X minutes for better anonymous surfing. Advanced proxy list testing ,sorting and management. "I have been looking for such a software for a long time. 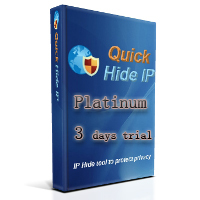 Quick Hide IP Platinum is the best one I find. I can hide my online activicy now. Quite easy to use. Very nice." "I start the software to get proxy list..I choose UK proxy from it and click the Hide IP button. After that, I check my IP address. It has been changed to UK immediately. All the website shows that I come from UK now. I don't need to find and test proxy anymore. crazy! Such a time saver." "I was using it some time so I thought I’d report them here since most of the success is due to using Quick Hide IP Platinum. Last month my school's IP is blocked by some sites for the spam reason. It seems it is cause by some guys in our school but the whole school is impacted because we have only one IP address. Thanks for the software, I could change my IP to another one to visit these sites as normal"
This video shows how easily you could get the software to work for you. It doen't need any learning curve!